Australia's Matt Hall up next, followed by Mike Goulian. That's more like it... he's through at 198kts and the first split goes GREEN, just 0.004s off faster than Chambliss. That is disastrous for Hall. He's in 11th place overall with his Run 1 time of 57.459... a grimace from Hall in the cockpit and he knows that he's got so much work to do tomorrow to battle his way through the head-to-head rounds in order to replicate his Cannes success. 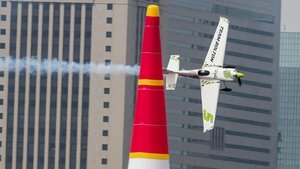 Goulian is currently leading the World Championship standings, and he's got to knock his fellow US pilot off the top spot to earn the strongest position ahead of the Round of 14 on Race Day tomorrow. Remember, the goal is 56.058, set by Chambliss earlier today. 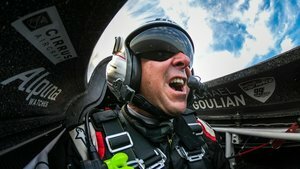 Goulian takes the final spot in the Qualifying session today... he looks a little off the pace from the off, with Gate 6 catching the American out and he picks up +2s... there's a lack of confidence from the usually cool and collected pilot who's earned a wealth of experience in the Master Class. Another unexpected result out there today... the chicane is a real test out there today and it's causing some issues for the pilots, including Goulian, who finishes up in 12th overall with another Run to redeem himself. The first splits are green and Goulian just gaining so much more pace in the track... he seems to have found his line and he is executing ssome superbly controlled VTMs and the timings are showing his expertise... look at those times! Look at that performance! Goulian has SOUGHT REDEMPTION with a track record of 55.242! AND THAT'S HOW YOU WIN QUALIFYING! The game plan worked really well... we're going to look at yesterday's flying, this is anybody's racetrack, it's so technical... it's going to be one heck of a race tomorrow. Well, what a finish to today's Qualifying session. Goulian finding a perfect finish to a tumultuous Qualifying session. So that's a wrap for Qualifying Day here in Chiba. 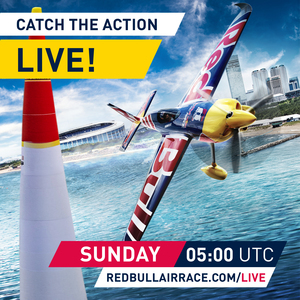 If there's anything we've learned today, it's to expect the unexpected tomorrow, when the pilots go head-to-head over the ocean in a bid to take the win at the third round of the Red Bull Air Race World Championship. Join us tomorrow - we'll be here ahead of the live action, getting you prepped for some supercharged, full throttle racing action! It's finally here... Race Day is set to kick off shortly with the Round of 14. It's a day to expect the unexpected... yesterday the gusty winds swung around from NE, and today they're coming at the pilots from the SW. So what worked for the pilots yesterday won't necessarily give them the right lines and approach today.